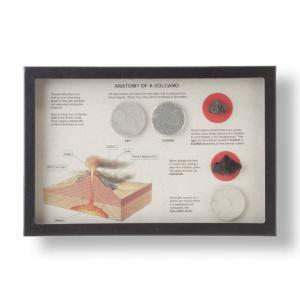 A great introduction to volcanology. From the opening moments of an eruption, to the settling and weathering of volcanic ash over many centuries, volcanoes influence everything from geography to agriculture. This exhibit features real examples of the products of a volcanic cycle. Ash, cinders, pumice/scoria, obsidian and volcanic clay are all represented with actual specimens. Each specimen is fully labeled with straight-forward descriptions.